The former Marky Mark is the typical Boston tough guy and above all, a motorcycling enthusiast, so it's no wonder Indian Motorcycles chose him as their brand ambassador. The Pain and Gain star is now leading the new Indian Motorcycles clothing line campaign – the Mark Wahlberg Collection. 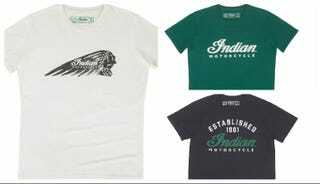 The limited edition clothing line is a "casual, all-season line that distinctively represents Mark's personal style and passion for the Americana heritage of the iconic Indian Motorcycle brand." Wahlberg will be front and center for the line, which will be available for sale in North America and Canada only. As for the rest of the world, there is hope as it won't be long before cheaper knock-offs will be in stores. Prices start at US $34.99 and top off at US $44.99. Check out the rest of the collection here. Would you wear anything from the Mark Wahlberg Collection?